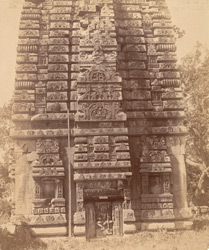 Photograph of the base of east façade of the sanctuary of the Parashurameshvara Temple at Bhubaneshwar, from the Archaeological Survey of India Collections, taken by William Henry Cornish in 1892. The Parashurameshvara belongs to the early group of temples at Bhubaneshwar and was built during the mid-seventh century. It consists of a square towered sanctuary preceded by a rectangular mandapa with a sloping roof. The outer walls projections of the sanctuary are decorated with sculptures of the Hindu gods, surrounded by bands of miniature figures and lotus ornament. The curvilinear tower is in the Orissan Nagara or Northern style and is covered of extremely fine sculptural ornamentation such as the kudu or arch motif, nymphs, divinities and mythical beasts. The mandapa is entered through two doorways and is lit through four lattice-work windows; those on the west are decorated with dancers and musicians and a figure of Lakshmi adorns the lintel. The walls are decorated with rows of figures of various Hindu deities. The sculptures seen on this temple came into full flowering in later temples.